I’ve been playing around in the studio with clay the last few days. One thing that I haven’t figured out how to use yet are the glossy pottery glazes. From what I’ve read, if you apply it incorrectly, or in the wrong place, it will drip, and the glaze melts, and then solidifies, and adheres the piece to the Kiln Shelf. This is a major big deal, and I guess your shelf is totally wrecked, or you need to use a grinder to get it off, or something equally difficult. I’ve been firing my pieces once, and then coloring them with acrylics. This works, and they look great, but they are not food safe. I’ve got a bowl that I made that I’d actually like to be food safe, so I bought some clear glaze, and I’m going to give that a try. There are also flat colorants called underglazes, and for some reason, they DON’T stick to the kiln, but again, they aren’t food safe either. 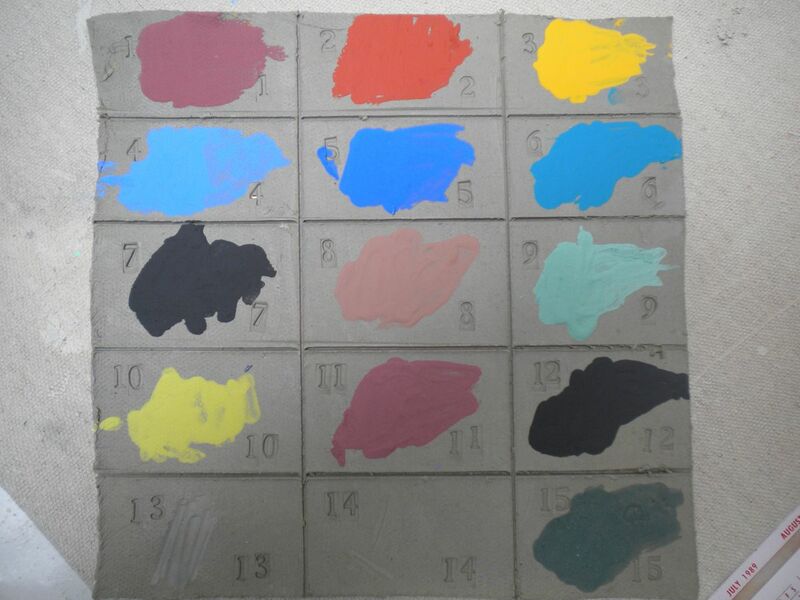 I’ve got a swack of little jars of these underglazes, but I don’t have a clue if they fire to the color in the jar, or if the color is totally different, so I made a couple of color swatch sample pieces today. I have no idea what these ones are, or if they’re foodsafe. The colors are really hideous at the time of application. 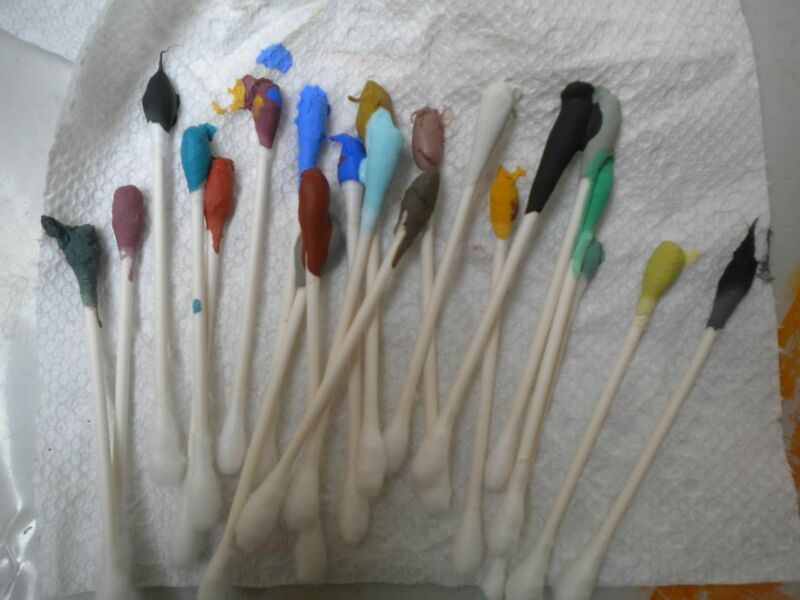 I used Q-Tips to apply the samples of paint, and they just looked so cool, I couldn’t resist taking a pic. I love love love love my studio………….. The dolls are really creepy. Better get the sewing machine out. Ha, no chance, my sewing machine is possessed by demons and makes me say really bad words…..
Hi Cher. Maureen B. passed this post onto her cousin Carole M. who passed it along to me. I am Carole’s sister-in-law. I am a potter so they asked if I could share some info on underglazes and glazes. Usually they dye the underglazes to resemble the final fired colour. If you paint on the underglazes and then dip or paint the clear glaze you have on top (assuming you bought this clear glaze from a supply store and you fire your kiln to the same temp as recommended) you will have a food safe vessel. The way to avoid fusing your pieces onto the kiln shelves is simple. Wax the bottom of your work before applying the glaze. You can melt beeswax and sit your bowl in it or you can buy wax emulsion and paint it onto the bottom. Either way you need to bring the wax line up a bit on the sides of the pot so even if the glaze runs a bit when it melts it won’t touch down on your shelf. You can also brush “kiln wash” onto your shelves and if there is a touch down of glaze the shelves are somewhat protected. You can make your own or buy it from a supplier. Hope these comments help. Have fun! If you have other questions you can reach me by email. Debbie. Wow, thanks SO much for taking the time to send me this info. I have a bowl that I used underglazes on (as greenware), and I’ve fired it once. Now I’ve coated the inside with 2 coats of clear gloss glaze and I’ll fire it a second time. 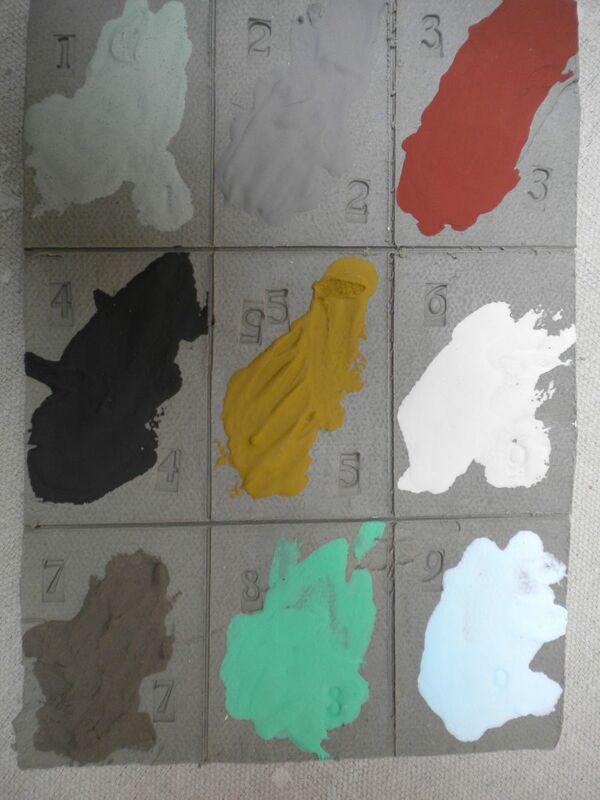 I use Vashon White Paper Clay, which I love, and it fires to Cone 6. What the clay guys here have told me is that there isn’t a “good” clear glaze for Cone 6; they sold me one, and wished me luck, ha! I’ll let you know how it turns out. Wax as a resist is a great idea, thanks. An alternative that I thought was brilliant is this: Put a fairly tight-napped piece of carpet in a flat container. Fill the container with water so that is just barely covers the carpet. Paint your piece, and then rub the bottom of it on the carpet, vigorously, to remove any glaze. What do you think?